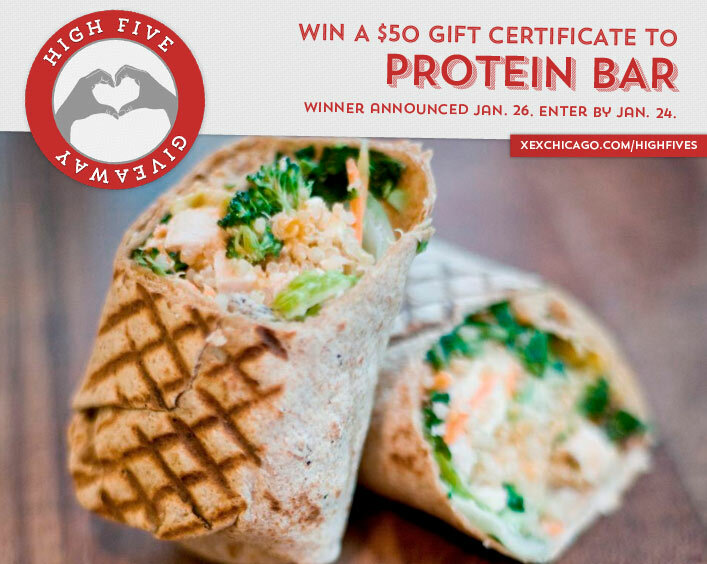 Win a $50 Gift Certificate to Protein Bar! Congratulations to Brandy Brixy on winning our 113th High Five Giveaway of a $50 gift certificate to Lloyd’s! Our next giveaway is for a $50 gift certificate to Protein Bar. They do healthy…tastier with a commitment to flavor and great service. Protein Bar knows you’re busy and want you to take care of yourself at the same time — so they make it simple, fast, and delicious to fuel your body while allowing you to handle the other things in your life. Protein Bar’s focus is on serving healthy, flavorful food in a hip, trendy environment quickly and efficiently so you can get back to your day. Their menu, their service style, and their stores are set up for quality, style, and speed. Protein Bar has multiple locations in Chicago. Visit their website at www.proteinbar.com or call them at 312.631.3690. What Hollywood star sported a high braid at this year’s Golden Globe awards? Now, just add a comment to this post with the right answer to be eligible to win! The winner will be announced on Monday, January 26. Entries must be received by midnight on Saturday, January 24. Good luck! Emily Blunt rocked the high braid! Emily Blunt! She looked great! Emily blunt! It was beautiful! Emily Blunt. But also Louise Roe and Joanne Froggatt rocked the milkmaid braids as well. Emily Blunt– loved the look! Emily Blunt sported a high braid! Braids are all the rage lately. Emily Blunt’s elegant braids were split down the middle, complimenting her white silk dress beautifully. - Kelsie C. via Yelp!